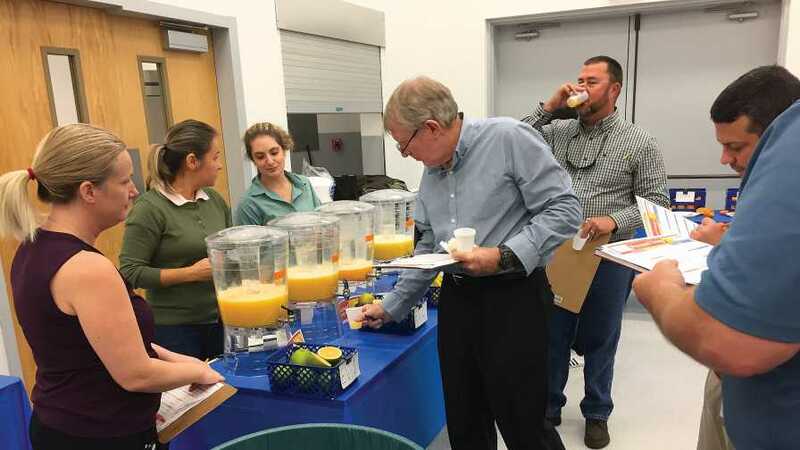 Attendees had a chance to sample and evaluate new selections during the season’s first UF/IFAS citrus variety display gathering at the Citrus Research and Education Center. The first UF/IFAS citrus variety display for 2018-2019 started with a bang. 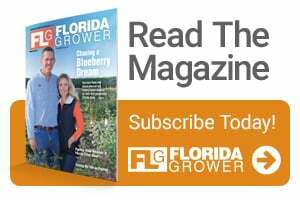 A large crowd of growers, packers, marketers, buyers, and processors gathered at the Citrus Research and Education Center in late October to sample the latest developments from the UF/IFAS citrus breeders. Fruit was divided into tangerine/mandarins, grapefruit/pummelo, limes, and orange and orange-like selections. Attendees were asked to complete a series of survey questions, scoring each of the displayed selections on a host of characteristics and traits. The completed surveys will be compiled and summarized by Dr. Yu Wang’s laboratory, and the results will be shared with the breeding teams to inform their release and commercialization decisions. Wang is Assistant Professor at UF/IFAS, and her Extension responsibility includes working with growers and processors to improve quality, particularly the flavor of citrus products. The first UF/IFAS variety display in 2017-2018 was canceled due the impact of Hurricane Irma. This year’s display included a robust assembly of citrus selections in each fruit-type category. This might have been the best October display so far. Variety displays offer the best opportunity for the industry to see and experience the results of Florida’s investment in citrus breeding, to remain abreast of the progress of varieties that may be commercially significant, and to converse with the breeders about their work. Juice of a ‘Hamlin’ sweet orange hybrid was provided alongside juice of EV-1, EV-2, and ‘Hamlin.’ The juice of the new hybrid is very orange-like in flavor, with color and flavor superior to ‘Hamlin.’ This selection does not meet the current standard of identity for orange juice by itself, but might be of interest to the processed sector. Being a new selection, juice has not yet been pasteurized or stored. 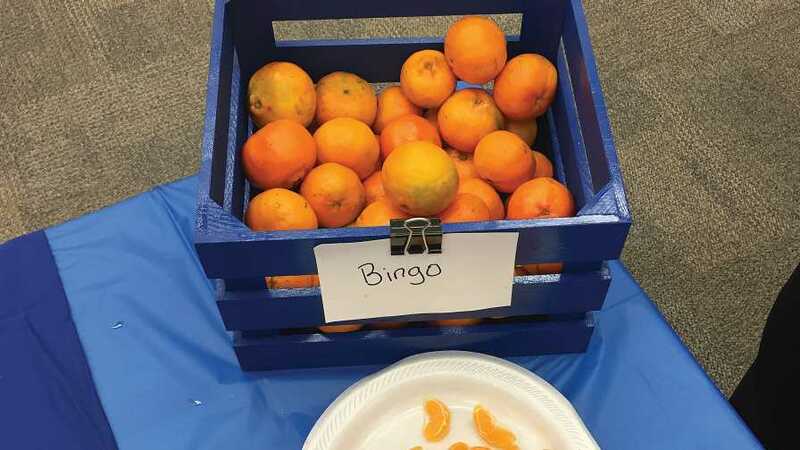 Samples of previously released ‘Bingo’ mandarins on display at the first UF/IFAS variety display for 2018-2019. One seedless tangerine/mandarin, BB4-8-20, formerly called the ‘Mini,’ was displayed in four groupings. One was grown in the Indian River District, two other samplings were grown on the Ridge on different rootstocks, and another sampling came from trees in a citrus under protected screen (CUPS) structure. The manner in which this selection was displayed highlighted the variation that may arise from any single cultivar, depending on growing conditions and techniques. ‘Sugar Belle’ was shown from outdoor trees as well as from a CUPS structure. The fruit from CUPS was significantly more mature internally than fruit from the field. ‘Sugar Belle’ fruit from CUPS has acid levels already in the 0.9 range, significantly lower than comparable field trees. CUPS trees are exposed to more heat in the summer, which may result in lower acid. Interestingly, the CUPS fruit also were completely seedless yet had good size. Additionally, CUPS trees are on more aggressive nutritional programs intended to quickly establish canopy, which may contribute to thicker peels and less external coloration. More study is required. A broad selection of seedless and low-seeded mandarins were available for sampling. A cross between a sweet orange and a pummelo resulted in a sweet pink, early grapefruit-like selection. This fruit proved quite popular with attendees. A hybrid ‘Flame’ grapefruit also was a focal point for grapefruit growers and packers. Fruit quality was quite good, and the tree is reported to show somewhat better recovery in the field than other grapefruit. Long-term results are not known, but researchers will be keeping a close eye on this one. 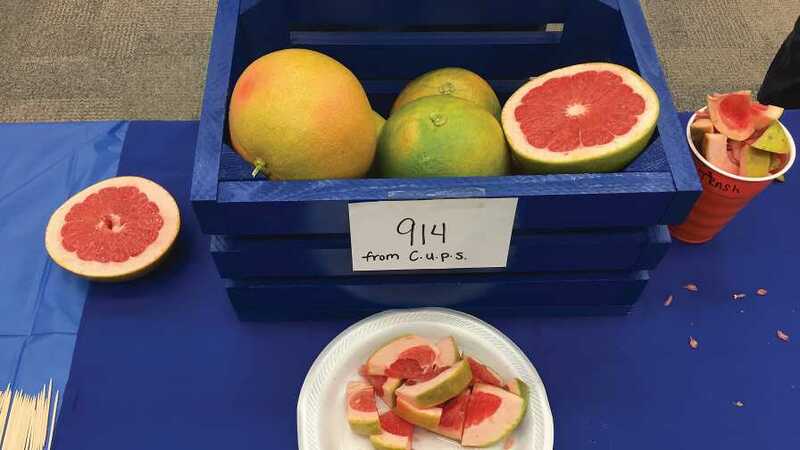 Fruit of the 914 grapefruit hybrid was available from CUPS and field production. The fruit from the CUPS appears to have more advanced maturity in comparison to the field-grown fruit and also shows good size and peel blush. It was easy to see why this selection advanced into the first FAST TRACK suite and why commercial licenses are now available. A seedless variant of the ‘Pummel-ette’ (FAST TRACK Suite I) was on display. This fruit had beautiful dark red flesh and very good early season flavor. Two lime-like hybrids were displayed. Attendees continue to struggle with how best to evaluate acid fruit types, but there was unified consensus that this fruit had the appearance, flesh color, flavor, and aroma of true lime, with what may be better cold tolerance. The harvest window appears to be somewhat later than ‘Persian’ lime, increasing the possible commercial appeal — as the maturity would be during the normal packing season for most packinghouses. Trees are reported as holding their own with HLB. An easy peel, seedless mandarin-lime hybrid also was available. Flavor is similar to a sweet lime but with slightly more acid. The flavor resembles that of limeade. This is a new hybrid and it is too early to assess productivity or susceptibility. All start at 10 a.m.
After the display, there will be a lunch and then a citrus breeding symposium in the afternoon. Breeders from Australia, Italy, Korea, Spain, and Uruguay will be presenting information about their programs, new cultivars coming, and commercialization approaches. This is a great opportunity for the Florida industry to learn what is going on in other citrus-producing countries. We hope to see you at the next displays. 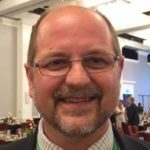 Breeding is the future of Florida citrus and breeding requires perseverance and patience. We are admittedly short on the latter these days, but seeing the results of this work and the importance of remaining committed to the process cannot be overstated.